Credit card orders may be placed directly over the Internet on our completely secure site. None of the information provided on this site will be provided to any third parties. 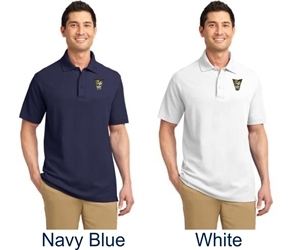 The shirt is available in navy blue and white. 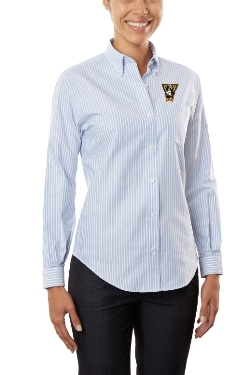 This shirt has a gently contoured silhouette and is sized and styled for women. This shirt is made of 100% polyester. It is Port Authority/Sport-Tek brand's Dri-Mesh material, designed to wick away moisture with ease. This shirt is made of 100% polyester. It is Port Authority's Dri-Mesh material, designed to wick away moisture with ease. 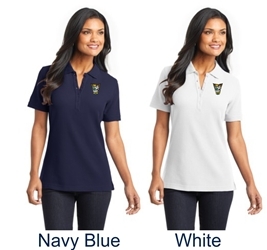 This shirt has a gently contoured silhouette and a V Neck collar. It is sized and styled for women. This shirt is made of 100% polyester. It is Cool & Dry material, designed to wick away moisture with ease. It has a relaxed fit for extra comfort. 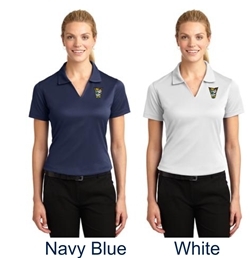 The navy blue shirt is accented with gold tipping on the collar and solid gold side panels of the shirt. 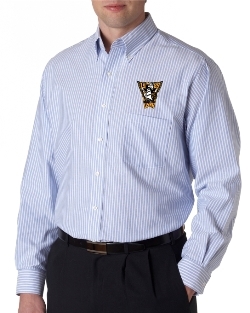 This is a blue/white striped, 55/45 long sleeve Oxford shirt with button down collar and left chest pocket. It is wrinkle-free and stain repellent. 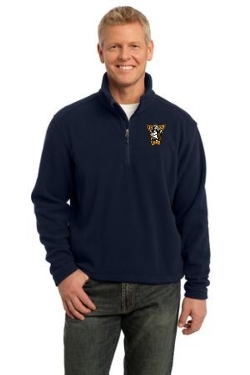 The class crest is embroidered above the pocket. This is blue/white striped 55/45 long sleeve Oxford shirt with an open collar. It is sized and styled for women. 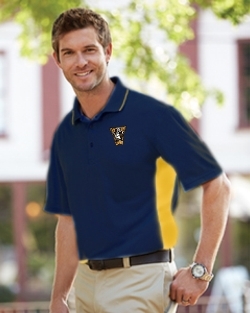 The class crest is embroidered on the left chest. This is a Port Authority brand, high end, fleece 1/4 zip pullover. It's a 65/35 cotton/poly blend fleece with a very soft feel. 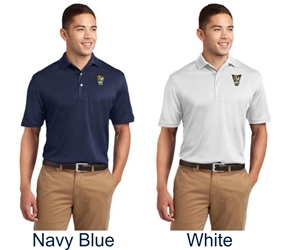 It is navy blue and the class crest is embroidered on the left chest. 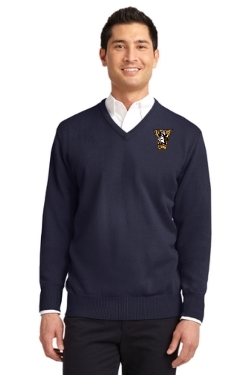 This is a luxurious navy blue sweater made of 60/40 cotton/nylon.It has a rib knit collar, cuffs, and hem. 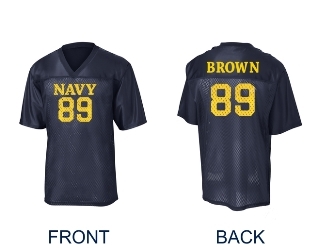 This navy blue football jersey is a "fan" jersey. The body is made of 3.6-ounce, 100% polyester mesh. 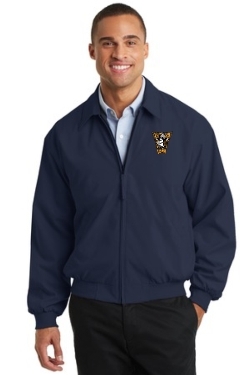 The yoke and sleeves are made of 4.1-ounce, 100% polyester. NOTE: You can have your last name on the back of the jersey as shown in the photo. Be sure to provide the name you want on the back of the jersey. Provide the name in the Comments Section of the order form at the end of your order. 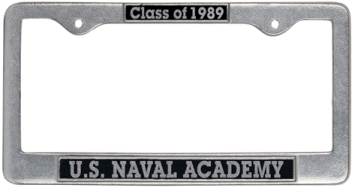 This license plate frame is made of durable pewter. 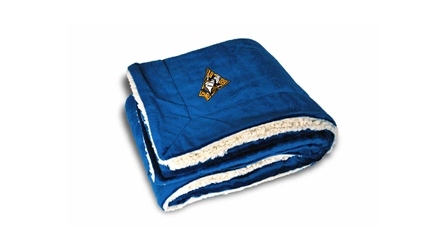 This is a 50" x 60" Navy Blue blanket. One side is lambs wool sherpa, the other side is faux micro mink. The class crest is embroidered on one corner. 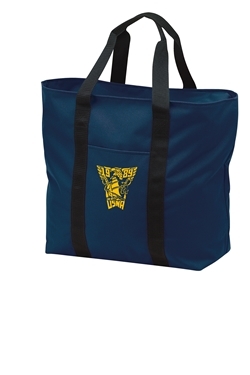 This tote bag is navy blue with a class crest gold imprint. It is made of 600 Denier Polyester Nylon. The tote has a zippered top,outside pocket, and inside zippered pocket. This is an 11 oz. ceramic coffee mug. 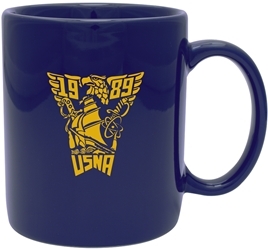 It is navy blue and the class crest is screenprinted in gold on one side. 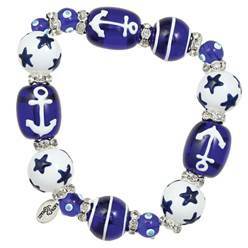 This is a hand painted glass bead bracelet. It makes a great gift!